New edition of a bestseller: The previous editions of The Secret have sold over 500,000 copies—this new edition features a self-assessment and includes frequently asked questions about the lessons of the book. Bestselling authors: Ken Blanchard’s books have sold over 20 million copies, and Mark Miller writes one of the top-rated leadership blogs in the world. In this new edition of their classic business fable, Ken Blanchard and Mark Miller get at the heart of what makes a leader successful. Struggling young executive Debbie Brewster asks her mentor the one question she desperately needs answered: “What is the secret of great leaders?” His reply—“great leaders serve”—flummoxes her, but over time, her mentor reveals the five fundamental ways that leaders succeed through service. This new edition includes a leadership self-assessment so that readers can measure to what extent they are serving and where they can improve. The authors also have added answers to the most frequently asked questions about applying the serving-leader model in the real world. 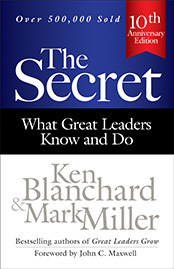 As practical as it is uplifting, The Secret shares Blanchard’s and Miller’s wisdom about leadership in a form that anyone can easily understand and implement. The book will benefit not only those who read it but also the organizations they work in and the people who look to them for guidance.